A mockup of the Cheetah C-RAM missile. 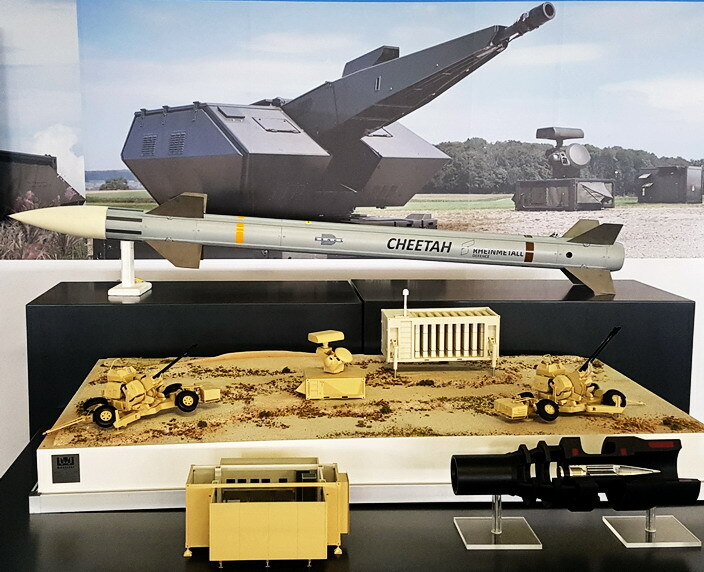 Rheinmetall and its partners are making swift progress with the development of its Cheetah counter-rocket, artillery and mortar (C-RAM) missile, with a number of important milestones being reached. The Cheetah concept was first unveiled at the September 2016 edition of the Africa Aerospace and Defence (AAD) exhibition. Development started in 2014, with static warhead tests in 2017 and two test shots in 2018. Further semi-dynamic warhead tests are planned for the end of 2019. The Cheetah missile is a completely new system with its own radar seeker that will have a proximity warhead, although it will use technologies that have been developed for other Denel Dynamics missiles. Guidance is via a data uplink with terminal homing via the missile’s radar seeker. Rheinmetall is aiming for the missile to be able to defeat BLU-109 ‘bunker buster’ bombs out to a range of 6 km. RDM CEO Norbert Schulze told defenceWeb the Cheetah’s warhead is unique and is being patented. The Cheetah will be available in containers of up to sixty missiles and can be integrated into mobile platforms such as trucks or armoured vehicles. The Cheetah is developed in partnership by Rheinmetall Denel Munition (RDM), Denel Dynamics (DD) and Rheinmetall Air Defence and Radar Systems (ADRS). Denel Dynamics is responsible for the missile system including the seeker, guidance system etc. The complete and integrated system is being marketed by Rheinmetall Air Defence. The Cheetah missile is designed to be integrated into Rheinmetall’s Oerlikon Skynex, Skyranger, Skyshield or Skyguard gun based air defence systems, but it could theoretically be fitted to other air defence systems.